If you’ve got some serious crud on your Revere Ware, see our cleaning guide for some good tips on how to clean them up. Here is what we used for ongoing maintenance of our Revere Ware. First, never put your Revere Ware with Bakelite handles in the dishwasher or oven. The oven can damage Bakelite; even though Bakelite is considered safe up to 350 degrees F, modern ovens can reach higher temperatures in places even when they are set for this maximum temperature. We’ve heard many complaints to this effect. Oven use will invalidate our generous replacement policy on manufacturing defects. Dishwasher use can dull Bakelite over time (see our dishwasher test) and is not recommended. We often use Scotch Brite pads to clean the inside of the cookware only. While it will dull stainless steel, the inside of cookware becomes naturally dulled because of metal utensils, so this won’t matter. 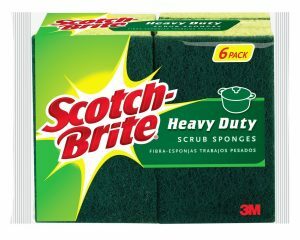 Scotch Brite pads do a good job of removing cooked on items, and hard water buildup for pots that are used to boil water. Don’t use these pads on the outside of your cookware, which you want to remain polished. 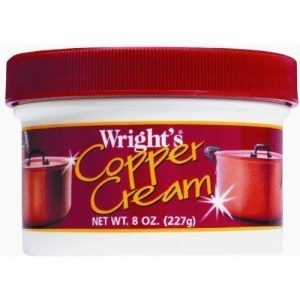 For the copper bottom, we use Wright’s Copper Cream. It is the closest we’ve found to the original copper paste offered by Revere Ware, and is more readily available. There are many other natural methods of polishing copper (like baking soda, lemon juice, or ketchup) but we get faster and better results with the copper cream. 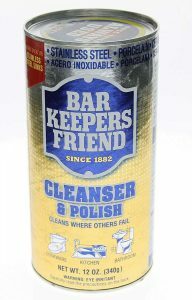 For polishing the stainless steel on the outside of the cookware, we use Bar Keepers Friend. While it won’t necessarily make your cookware look like new, it will add a little shine. We also like to occasionally use Bar Keepers Friend on the inside. It won’t make the dulled interior polished again, but, it does seem to smooth the stainless steel out a bit and make food stick less.